Clipper Limousines came from a love of vintage vehicles and restoring them to their former glory. The Wedding Clipper was unrecognisable as the gleaming white, smooth running vehicle it is today when it was rescued and revamped by its owners Ian and Dan. With interest in the Clipper vehicles from many people where ever they went, their hobby has been turned into a successful business, chauffering people in comfort and style to weddings and other events. 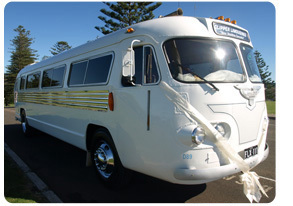 Have a look at our Photo Gallery to see the bus inside and out, and what it has to offer your special occasion.